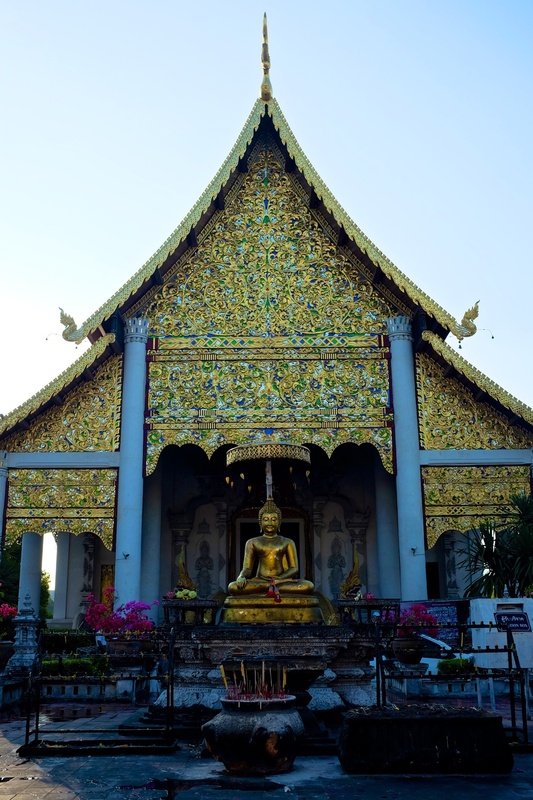 Since we arrived in Chiang Mai, I have been mesmerized with all the temples in this city and the fact that they look completely different than the Chinese temples we visited in Hanoi. I checked with Phung to see which ones should definitely be on our list because I wanted to make sure we don't see so many of them that we lose our appreciation for their beauty. That started happening to us when we were in Europe and kept visiting different Cathedrals and Churches, after a while they all started looking the same. 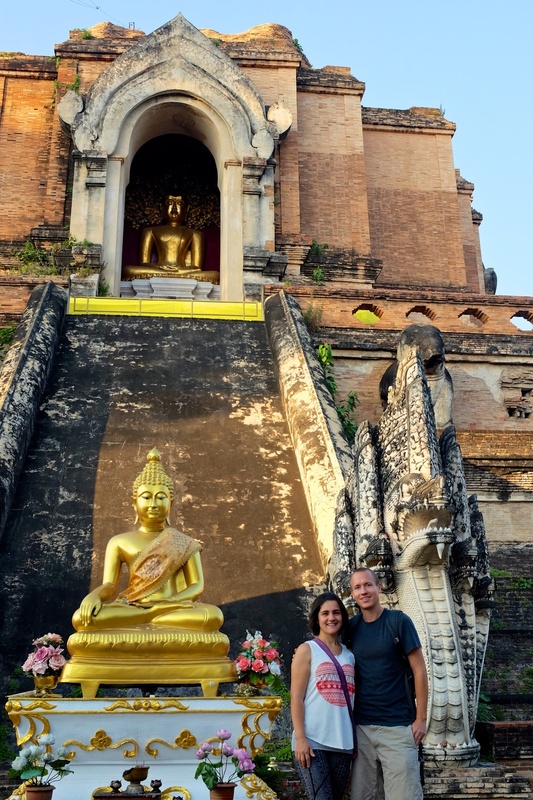 We decided to take a walk from our hotel to the Chiang Mai's Old town, where a few of the major temples are located. It was a bit of a hike, but we always find the best way to get to know a town is to walk around. 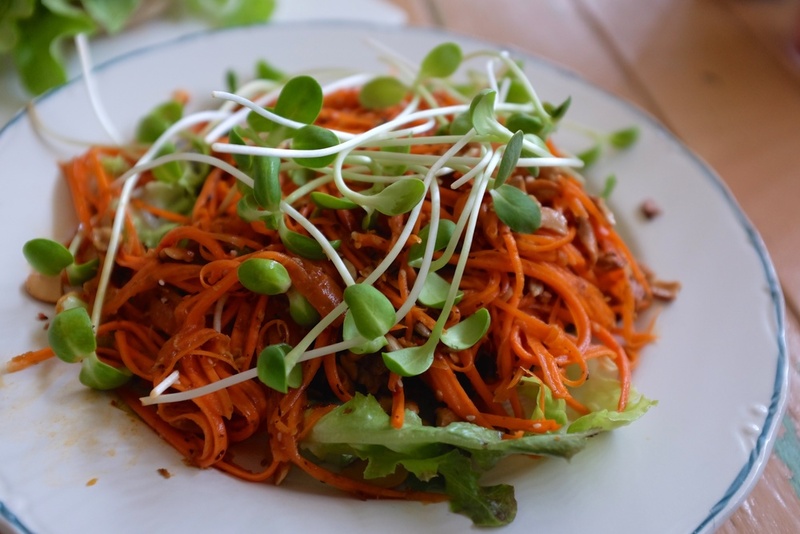 On our way, we encountered a lovely cafe called Bird's Nest. What an incredible atmosphere with lots and lots of healthy foods. 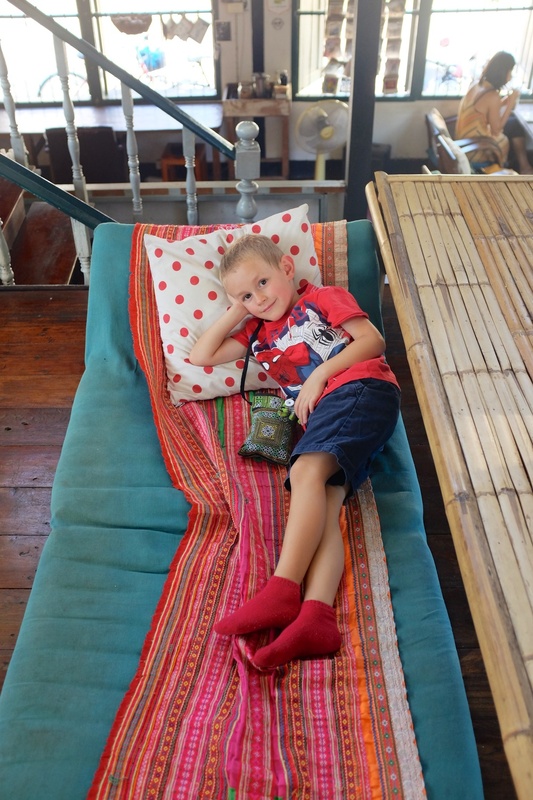 You can seriously unwind in this cafe, They have places where you can lie down or you may choose to take a rest in a hammock after or before your meal. The food was great, but we loved the juices even more. 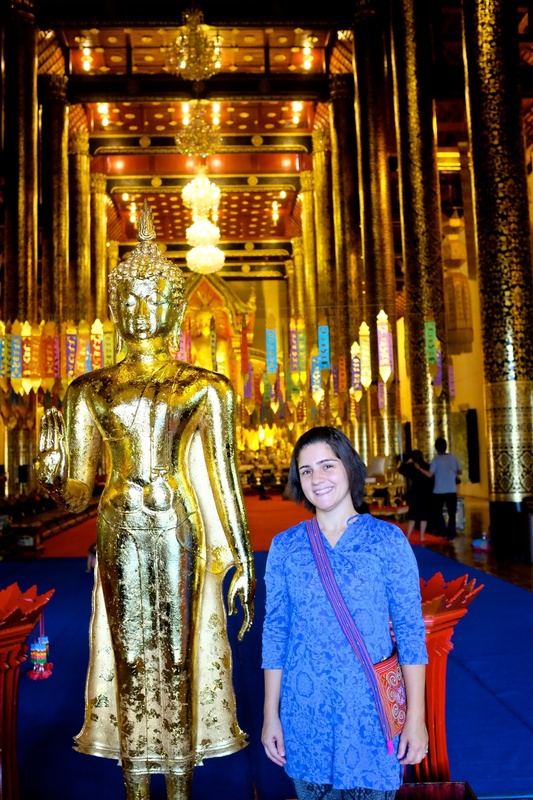 We started our day of temples with a visit to Wat Chiang Man. You are always required to take your shoes off before entering a temple. Some temples also have a dress code for women, with certain ones being more strict than others. One of the things we loved about Wat Chiang Man and a few others we visited along the way was that they were not full of tourists. We encountered a few others, but mostly we were able to enjoy our visit in the quiet and without having to be rushed around. 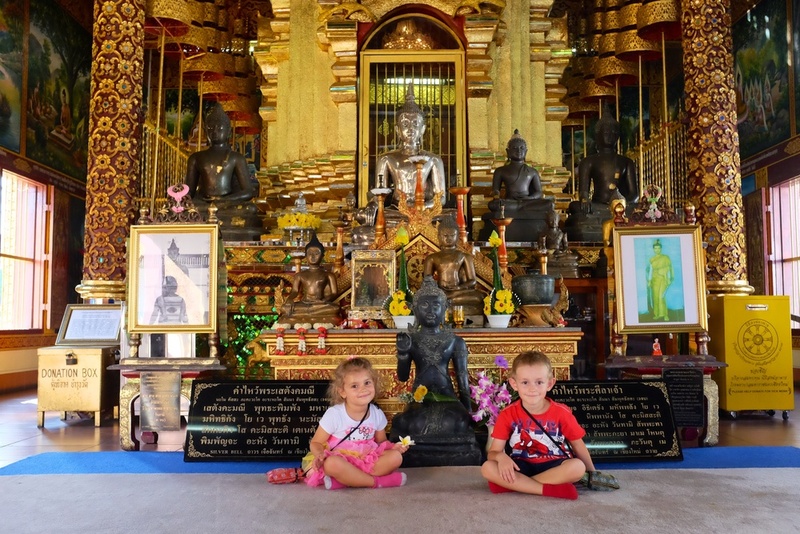 On our way to the next temple, Chedi Luang, we also visited Wat Panping and Wat Umongmahatherachan. Both, although small, were very beautiful with gorgeous paintings inside. The sun in Chiang Mai can get really hot really fast when you are walking. In fact there are barely any people that walk around in Chiang Mai. Most people either have cars or take taxis. We really needed to cool down before visiting Chedi Luang, and so we treated ourselves to watermelon juice and a bit of ice cream. Chedi Luang is by far the most beautiful temple in the Old town, in our opinion anyways. There are so many great things to see and lots to learn. Kian and Hannah enjoyed their visit too and had fun playing with the bells outside. Once there was a great shortage of water in the river that ran between 2 kingdoms. The people in the kingdoms were both relatives of the Lord Buddha, but they were going to fight over the water. The Lord Buddha knew that if did not prevent them, there was going to be a great bloodshed. So he came and wisely asked, "which is more important to you, water or relatives?" The Lord Buddha's question made the people realize that it is foolish to be fighting over the water. The Lord Buddha's statement and posture holding his right hand up not only prevents his relatives from fighting but also signifies peace to the world. Another interesting story was the that of Tan Pra Maha Kajjan (the 3rd picture from the left above). He was a monk and an enlightened one. However, he is not the Lord Buddha. 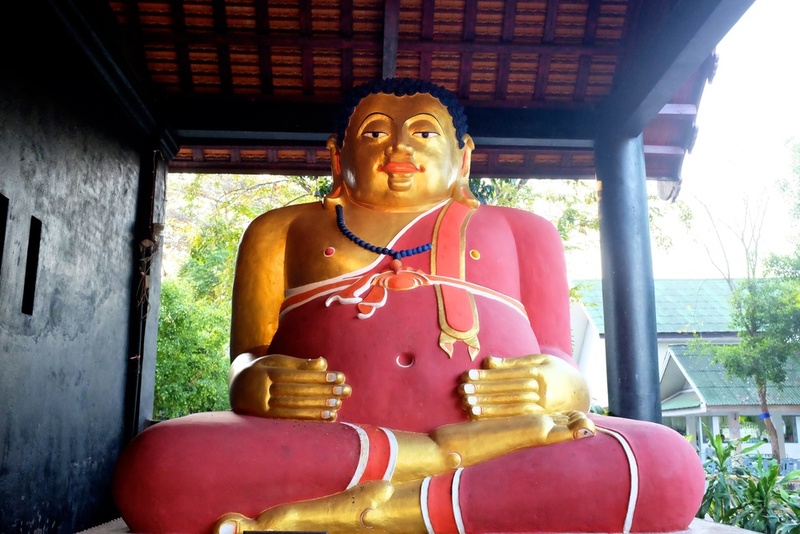 He used to be so handsome that several monks mistook him as the Lord Buddha. 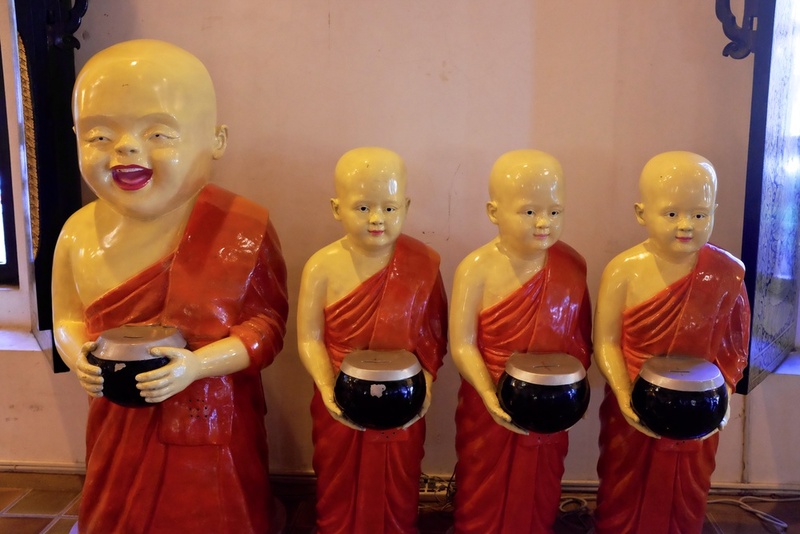 When other monks saw him from afar, they would prepare themselves as if they were receiving the Lord Buddha. Once a man saw Tan Pra Maha Kajjan and thought that if Tan Pra Maha Kajjan were a woman, the man would take Tan Pra Maha Kajjan as his wife. This evil thought to an enlightened monk is a grave sin; as a result the man immediately became a woman. He was ashamed and escaped to another town. 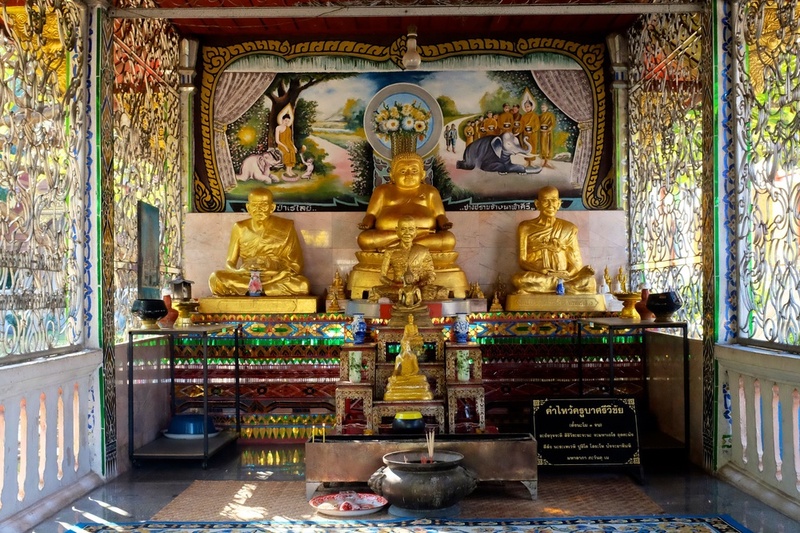 Tan Pra Maha Kajjan did not want to cause trouble to other people because of his good looks, nor did he want people to be attached to his outer appearance. Therefore, he changed himself to a fat, ugly looking monk. After walking through the temple and the grounds, we all had a nice chat with a young monk in training. We asked him about his daily routine and about the subjects that he studies. He told us that although there are no women in the program, some of his teachers for subjects like English and Math are sometimes women. As we began to head out of the temple we heard the monks praying inside the main building and popped our heads in to take a look. The entire visit was a great a experience. We headed back to our hotel on a tuk tuk taxi (after a good amount of negotiation). Later we met Miss B at a great restaurant called Good View Village and had a few yumtastic dishes. The atmosphere at this restaurant is wonderful and we were treated a live music the entire time. The quality of the food was great. The only downside was the distance and the higher prices. We are really missing our $6 dinners in Vietnam.